With an eventful World Cup having been the talk of the summer – VAR being the acronym of the tournament – and yet another successful Formula 1 sponsorship campaign, you’d be forgiven for thinking that exclusive watch designer Hublot’s specialism was confined just to the sporting world. But this is not so. Synonymous with technological innovation and stunning aesthetics, the Hublot Classic Fusion collection is a perfect blend of stylish design and unrivalled precision, embodied by the Limited Edition 45mm Automatic Chronograph Watch. The prestigious tailoring empire of Rubinacci, revered throughout the fashion world for its classical sense of style since the 1930s, is the inspiration behind Hublot’s latest, Limited Edition chronograph. Taking his cue from the iconic suits of London’s Savile Row, Gennaro Rubinacci introduced fine, tailored pieces to the Neapolitan elite in 1932 by combining exquisite style with the expertise of local tailors. Today, there are branches of Rubinacci stores across Italy and it is with his descendants that Hublot have collaborated to bring this truly astonishing piece, unveiled this year as the latest in a series of watches in their ongoing collaboration with Italia Independent. The Hublot Classic Fusion 45mm Automatic Chronograph watch retains the recognisable ‘porthole’ design feature that the brand is known for, which beautifully houses the authentic Rubinacci suit fabric behind the dial. But in a twist on previous timepieces released as part of the three-year collaboration with the Italian design powerhouse – which utilised the Hublot Big Bang Unico case – this range provides a more sophisticated and elegant aesthetic by adopting the Hublot Classic Fusion case. Fitting nicely under suit jackets as a result, this slim finish makes for an exceptionally wearable watch that will instantly lift any outfit. Nothing says classic London tailoring like pinstripes, and this Limited Edition model of chronograph, boasting navy fabric with intricate white pinstripe detailing echoed in the bracelet material, is the epitome of classic good taste. The blue analogue dial and blue counters reflect the traditional art of watchmaking with the polished black ceramic bezel, complete with 6 H-shaped titanium screws, setting a contemporary tone. The date window sits at 6 o’clock on the dial, naturally opposed by the Hublot logo underneath the 12 o’clock counter. The chic hands and index in polished plated ruthenium are securely protected by the sapphire crystal with anti-glare treatment. With a satin-finished, polished black 45mm ceramic case, the HUB1143 self-winding movement and an impressive 42-hour power reserve, all water resistant to a depth of 50 metres, this chronograph is as practical as it is tasteful and perfect for the modern man with his eye on luxury fashion. This truly unique watch is available for £13,300 or can be purchased on 0% finance from £221.67 a month over a four-year period. The fact that there are only 100 of these limited-edition pieces worldwide demonstrates the exclusive nature of this range and showcases Hublot innovation with traditional Italian tailoring at its best. Each watch case bears an engraving of the limited-edition number, making for a genuinely unique chronograph. Counting amongst its brand ambassadors high-achieving sports greats such as football legend Pele, Michael Clarke the accomplished cricketer and record-breaking athlete Usain Bolt, Hublot sets itself apart from its competition with this aspirational yet truly distinctive collection of timepieces and a style that will last. For Hublot, who set themselves the task of creating fusion, this series represents a stunning example of traditional horological expertise, perfectly blended with contemporary materials and design. 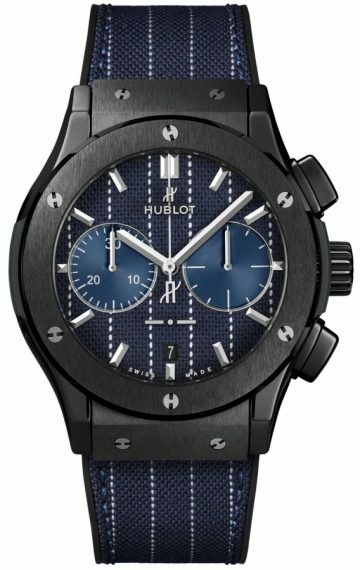 To see more of this watch – and the other Hublot watches we are delighted to stock – take a look at our website or call into our store and arrange a viewing.